So it’s Sunday night, New Year’s Eve, the last day of the month or whatever, and you have decided that now is the time to make some changes. Starting tomorrow, you are going to work out, clean up your diet, take your fitness to the next level, and get healthier and happier. That’s great, but unfortunately, the initial excitement has a tendency to wear off rather quickly when Monday comes around and you have to get up and go to work, and starting a diet and workout routine just doesn’t really seem that appealing. Basically, reality hits. At least, this is often the case for me. I love the excitement of starting out on a new journey and setting new goals. I’m a planner and, to be honest, half the fun is making the plans. Obviously, it’s also great to see the fruits of my labor, but getting from plan to result can be challenging. I have learned by now that if I don’t set up some sort of accountability measures, my carefully laid plans tend to be quickly forgotten. In this post, I will share a few of my most successful tricks for how to stick to your diet and workout routine. 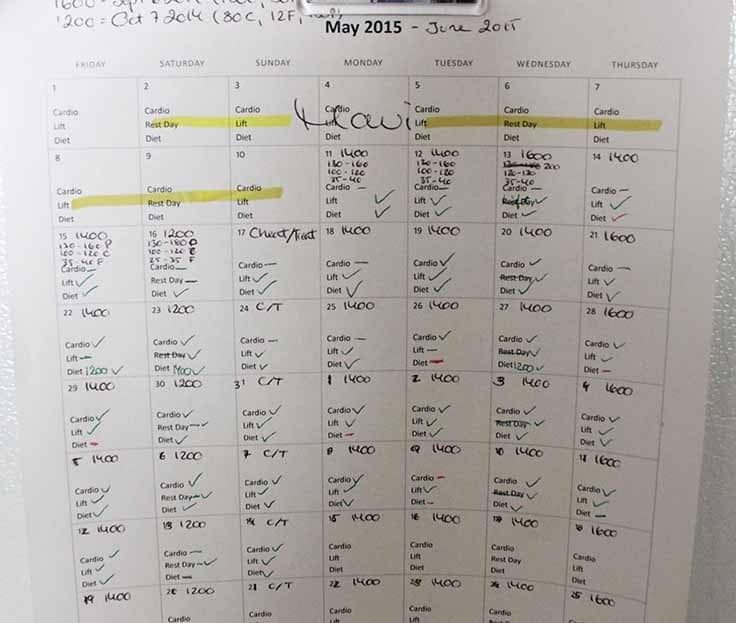 Back when I was prepping for my first fitness show, I created a calendar with all of my workouts and meals laid out for the three months up to my show. In the beginning, I just printed it and put it on my fridge so that I had easy access to the daily plan. After a while, I started giving myself little green checkmarks for every day that went by successfully and found it to be extremely motivating. So I have kept doing it. The calendar doesn’t have my specific workout routine or diet listed now, but simply a box for each day saying: Diet, Cardio, Weights. If I successfully stick to my plan for the day for any of these, I get a green checkmark in that category. If, for some reason, I fail to do a workout or go completely crazy with my diet (which does sometimes happen), I get a red checkmark in that category. I’m very honest with the checkmarks. That’s the accountability part of the exercise. Not only do I get the satisfaction of giving myself little green checkmarks, but I also have a very good visual reminder of my fitness journey for that month. It’s much easier to stay accountable to something tangible. Just saying “I want to work out more and be healthy” isn’t always tangible enough to actually make you do it. Instead, I suggest that you become really detailed with what you want to do and schedule time for it in your calendar. Let’s say you want to hit the gym three times a week and start bringing a healthy lunch to work. If that’s the case, then you should schedule an hour in your calendar three times a week to work out, and an hour every Sunday and Wednesday to do food prep for your work lunches. Don’t just try to “fit in a workout when you have time” — that rarely works. If you treat each calendar entry as an important appointment with yourself, you will have a higher chance of success. Nothing keeps you accountable better than making an appointment and having to stick to it. Let’s say your issue is that you are having a hard time getting to the gym. A great solution could be to make a gym date with a friend (or even better, your spouse or partner). I bet you’ll make it there if you’ve organized to meet someone. If I wanted to start working out bright and early in the morning, I would definitely find a workout partner, since I’m not a morning person. If I knew that a friend of mine was waiting for me outside, I would always get out of bed to meet them, even at 6 am. This also works for your diet. I don’t really have a problem getting to the gym (I actually love working out), but sticking to my diet can be HARD. Having Tobias around really helps to keep me on track. We don’t eat the same things most days, but just telling him about what I eat and food shopping together makes me “cheat” much less often. Getting support from your loved ones can make all the difference when you’re trying to do something difficult. We all set out with the best intentions and plans, but sometimes we need a little help staying on track. These three tips on how to stick to your diet and workout routine can help keep you accountable and make it easier for you to reach your fitness goals. Good luck! Great website. Very informative. I’m a type 2 diabetic. I do go to the gym regularly, morning workout, but sometimes I can feel that my energy has drained away & have to terminate my session. What can I eat & when, before going to the gym for optimum performance? Thanks. Kishor. I live on Long Island and enjoy going outside walking. Since 2017 I have tracked my walking and I was pleasantly surprised that in 2017 I logged 777 miles. I maintain a sub 20 minute mile for my entire workout. I had both my knees replacement in May and August of 2018. The beginning of November I was out walking again and doing 3 plus miles with a sub 19 mile for the walk. I track my walks with Map My Walk and then post it as a public posting on Facebook. My friends can keep up with my walking and some friends motivate me with positive comments. For November and December I walked 129 miles and since the New Year 50 miles. The NY cold doesn’t stop me but I find that my blood glucose drops very rapidly in the winter. I am a 67 year old Person with Type 1 Diabetes, pancreatectomy July 2008, and wear both the Omnipod and Dexcom G5. Great article! So you did cardio everyday it looks like ! Its definitely a challenge ever since I started working 10 hr to 11 hr days. And i will definitely will do that on my planner calender I have! Thanks. This is a great article. I particularly like the idea of the calendar with the check marks! Thank you for that idea! I’m going to try it! I agree with you about planning both the meals and the workouts. Here’s to success! Really love reading the articles and ways to stay on track. I find it so helpful. I’m going to implement a calendar and do as you suggested.